The last time I made this chocolate yogurt cake was 5 years ago, almost exactly. I made several batches, practicing through trial-and-error until I was able to insert a tunnel of German chocolate cake filling in it without ending up with a gooey mess. You see, my husband was celebrating his 30th birthday some 3,000 miles away from me, and I was desperate to make a German chocolate cake that I could send to him in the mail. I’ve made some sort of German chocolate cake for my husband’s birthday every year before and since. Some were pretty spectacular. But this year I didn’t have all the right ingredients on hand. 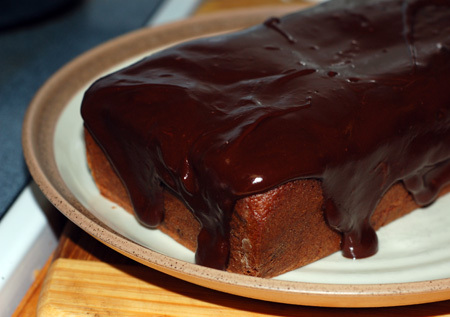 Instead, I used my last few tablespoons of cocoa powder to revisit that chocolate loaf cake, studding it with chocolate chips and slathering it with a chocolate glaze to make up for the short supply. You could make any number of other modifications, or simply eat it plain, dusted with powdered sugar. And I happen to know that it can survive a cross-country trip with no problems. Preheat oven to 350F. Grease and flour a 9×5 loaf pan (or use cocoa to dust, as it will show less in the finished cake). Whisk together dry ingredients in a bowl. Whisk together the butter and sugar until light and fluffy, then add the vanilla and egg; mix until uniform. Add the flour mixture and yogurt in alternating thirds, starting and ending with the flour. Spread the batter into the prepared loaf pan, and bake for 35-40 minutes. The loaf is done when a cake tester comes out clean. Cool in pan for 30 minutes, then remove from pan and allow to cool completely. In a double boiler over hot but not boiling water, combine chocolate chips, butter and corn syrup (you could also do this in the microwave at 50% power, checking and stirring at 30 second intervals). Stir until chips are melted and mixture is smooth, then add vanilla. Spread warm glaze over top of cake, letting it slide stickily down the sides.